Tickets will go on sale Oct 1, and are $12.00 for adults and $10.00 for youth. For reservations, call our Box Office at 641-792-1230. The box office is staffed weekdays, starting Oct 1, from 11:00 am - 1:00 pm and 6:30-8:00 pm, and one hour before each performance. Takes place in the living room of the Brent's country home in the play Nothing's On, and the backstage area. Wednesday afternoon. (Three different theaters between January and April.) 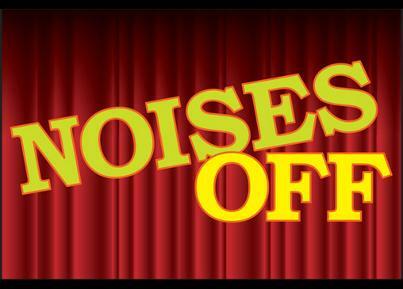 ’Noises Off’ is “the funniest farce ever written,” The production presents a manic menagerie of itinerant actors rehearsing a flop called Nothing’s On. Doors slamming, on and offstage intrigue, and an errant herring all figure in the plot of this hilarious and classically comic play. NOISES OFF takes place at an indeterminate time, in some decade of the later 20 th century. We are costuming the ensemble cast in the 60’s-70’s range. It is a British farce and truly a play-within-a-play. Most of the characters have dual roles, that being their actual persona and their stage role. The story takes place in the living room of the Brent family home in Britain, a renovated 16th century mill. Mrs. Clacket DOTTY is a “Grand Dame” of the theatre. She is rather a fading star. She is professional but forgetful. She is involved in a somewhat, secret relationship with GARRY. Her on-stage role of MRS. CLACKETT is a cockney housekeeper for the Brent’s. MRS. CLACKETT is friendly, hospitable, though at times a bit slow and hard-of–hearing. Lloyd Dallas The director of the play “NOTHING ON”; LLOYD is temperamental and has little to no patience for the foibles of his cast. He also makes a game of becoming involved with two women simultaneously in the production, BROOKE and POPPY. Roger GARY is an actor who has great difficulty putting his thoughts into words and speaks in “sound bites”. He has a “May/December” relationship with DOTTY and has a very jealous nature where that is concerned. On stage, GARY’s character ROGER is an English real estate agent whose agency is charged with renting the home of PHILLIP and FLAVIA BRENT. He attempts to use the home for his own personal tryst. Vicki BROOKE is a young actress who completely lacks focus and most often seems lost in a fog of her own. She has a penchant for losing her contact lenses. LLOYD is frequently trying to arrange time alone with her. On stage VICKI is a young Englishwoman who works for the British tax service and wishes to engage in a tryst with ROGER. Poppy Norton-Taylor POPPY is the assistant stage manager. She is emotional, overly sensitive and highly intimidated by LLOYD. She is envious of Brooke, whom she understudies. She is secretly involved with LLOYD, but only when he so chooses. Phillip Brent/Sheikh FREDDY is an actor with a curious fear of violence and blood. His common reaction to conflict is a nosebleed. He lacks confidence as an actor and is continually searching for his “motivation”. On stage PHILLIP BRENT is an English playwright currently living out of the country with his wife FLAVIA in order to avoid paying taxes. PHILLIP and FLAVIA have come home for the weekend for an anniversary celebration of their own. FREDDY’s on-stage bit part is that of a SHEIKH, a middle-eastern man interested in renting FLAVIA and PHILLIP’S home and astonishingly so, is the spitting image of PHILLIP. FLAVIA BRENT BELINDA is a cheerful, ever-helpful and reliable actress. She may have feelings for FREDDY. On stage, as PHILLIP BRENT’s wife FLAVIA, she is dependable and every supportive of PHILLIP. She and PHILLIP are home in England on their own little “quiet weekend away together”. Timothy Allgood As his name suggests TIM is the jack-of–all-trades and severely overworked. He is the set builder and repairman, stage manager, and understudy for SELSDON and FREDDY. He tries extremely hard but is clearly overwhelmed and overworked. Burglar SELSDON is an older English gentleman, having spent a long career treading the boards as a serious actor. He is a gentle alcoholic who uses his hearing loss to his advantage when he so chooses. His onstage character is that of a cockney burglar who has made a lifelong career of break-ins and robbery.